SRG CULINARY BLOG: Ann Cooper, "The Renegade Lunch Lady"
Last week we were fortunate to have Ann Cooper join us as part of our ongoing Food Revolution speaker series. Ann, also known as "The Renegade Lunch Lady," has made it her mission to improve the health of the next generation. She has worked with school districts all over the country to create more nutritious lunches, add salad bars for kids to school cafeterias, educate kids on healthier choices, and even teach them how to cook for themselves. 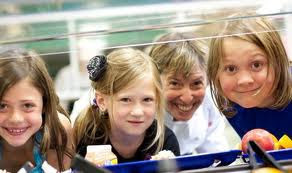 Ann first gained national recognition for her overhaul of the Berkeley, CA school district's cafeterias, which she did by eliminating processed and packaged foods and replacing them with fresh, local, and when possible, organic options. She has also worked with school districts to help improve the environment for kids eating lunch through such measures as lengthening lunch periods (to allow kids to get through both a hot lunch and salad bar line and still have to eat) and having recess before lunch (so younger kids don't rush through or skip lunch just to get outside to play). Beyond this, Ann has worked alongside some of the biggest names nationally, in both food and politics, to help further her cause and disseminate her message. She is also taking steps to help shape policy and government spending in order to make healthier lunches possible for more school districts. It is through changes like this that she hopes to put an end to the prediction that for the first time in history, kids born in the year 2000 have a shorter life expectancy than their parents, this due directly to diet-related illness.